Why Would You Need A Bariatric Wheelchair? Bariatrics is the medical field and terminology that addresses obesity, both in treatment and products, such as medical equipment with appropriate weight capacities. Individuals with a Body Mass Index exceeding a healthy range have a much greater risk of medical issues. These include heart disease, diabetes mellitus, many types of cancer, asthma, obstructive sleep apnea, and chronic musculoskeletal problems..
UNDERWEIGHT (Less than 18.5) – You might think that being underweight is better than being overweight. However, being underweight is associated with numerous health risks. It can also be a symptom of larger health problems. If you are underweight, be sure to speak to your doctor about your weight. NORMAL (18.5 to 24.9) – If your BMI indicates that you are a normal weight, congratulations. Now, it is important that you maintain this weight in a healthy way. If you are unsure about a safe, healthy way to maintain a weight in the normal range, ask your doctor about creating a healthy diet and exercise program. OVERWEIGHT (25 to 29.9) – A body mass index in this range is a strong indicator that you may be overweight. BMI readings in this range may be misleading for athletes, children, and certain ethnic groups; however, if your BMI is between 25 and 29.9 you should discuss your health risks and a healthy bariatric weight loss program with your doctor. OBESE (30 or greater) – With the rare exception of some professional athletes and bodybuilders, if your BMI is over 30, there are increased health risks based on weight. Obesity can lead to heart disease, stroke, joint pain, and more. The goal of obesity treatment is to reach and stay at a healthy weight. One may need to work with a team of health professionals — including a dietitian, behavior counselor or an obesity specialist — to help understand and make changes in eating and activity habits. The initial treatment goal is usually a modest weight loss — 3 to 5 percent of total weight. That means that if one weighs 200 pounds and is obese by BMI standards, one would need to lose only about 6 to 10 pounds (2.7 to 4.5 kg) for health to begin to improve. However, the more weight one loses, the greater the benefits. The prognosis for obesity depends upon the associated complications and response to weight loss treatment. Therefore, the primary factor in maintaining weight loss is a long-term commitment to regular exercise and proper eating habits. Some with obesity require the use of a specialized bariatric power wheelchair. Quantum Rehab®, the global leader in individualized power chairs, puts an emphasis on bariatric mobility technologies specific toward the needs of those with obesity. 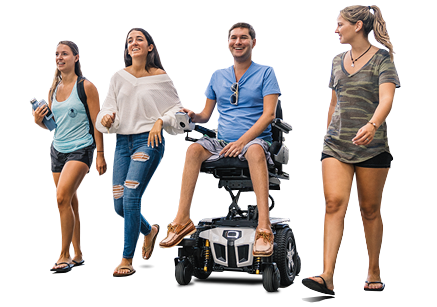 Quantum Power Chairs incorporate power-adjustable seating for user repositioning and comfort; specialty drive controls, including those requiring minimal hand strength; and, a highly-adaptable design to meet an individual’s current and future needs. What’s more is that Quantum offers models with exceptional performance at bariatric weight capacities. Quantum Power Chairs feature the latest advanced technologies to increase the independence of those living with bariatric needs. Bluetooth® is also integrated into Quantum’s Q-Logic 3 electronics, so those with obesity can operate much of their environment with the power chair drive control, itself. For those with bariatric needs, Quantum Power Chairs are designed to provide optimal medical comfort and maximum independence. Please click here for more information on Quantum Power Chair solutions for those living with bariatric conditions.